Apoksiomen Hotel Mali Lošinj ~0,2 km, Mali Losinj Hotel Apoksiomen is positioned in the real heart of the city of Mali Losinj, with most of the rooms providing magnificent views of the beautiful gulf of Mali Losinj. At the hotel's own café, which has an outdoors terrace on the promenade, you can taste authentic national and international delicacies accompanied by beverages. The hotel also has a variety of locally produced wines. The terrace is situated under 50-year-old palm plants with awe-inspiring views of the sea. Hotel Apoksiomen further presents a technically fitted seminar room for up to 40 people. 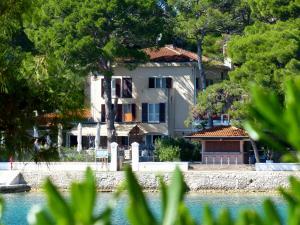 Vila Tamaris ~3 km, Veli Losinj price per day from € 37 Vila Tamaris is set in the real heart of Veli Lošinj. This family-run hotel is embellished in a modern style and presents an outdoors terrace with views over the local marina and the sea. Visitors can sit back in their ensuite room or in the communal lounge, using free internet access access. Featuring a shower, private toilet also comes with a hairdryer and bathrobes. Villa Diana ~1,2 km, Mali Losinj price per day from € 107 Positioned just 50 metres from the sea front in Čikat Cove, Vacation home Diana is 2 km from the centre of Lošinj. The Villa presents a à-la-carte dining establishment with an outdoor outdoors terrace looking out over the sea and a bar. Near the villa, visitors can find various sports amenities. All accommodation units are equipped with a tiny seating area, a desk and a chair. The private toilet presents a shower and hairdryer. Units are air-cooled and offer satellite television, wired internet connection, a minibar and a risk-free. The restaurant serves old-fashioned local specialties, meat and fish meals. Authentic Adriatic ~0.1 km, Mali Losinj price per day from € 100 Authentic Adriatic. Kitchen info: refrigerator, oven, microwave, coffee maker, toaster, ironing board. Entertainment and Outdoor adventures: TV, Satellite tv, CD player, DVD player, radio. Villa Mozart ~3 km, Veli Losinj price per day from € 31 Vacation home Mozart presents accommodation in the real heart of Veli Lošinj. The closest beach is at a distance of 150 metres, while the centre of Mali Lošinj is 4 kilometers away. All rooms come with a TV. Some units have views of the sea or back yard. 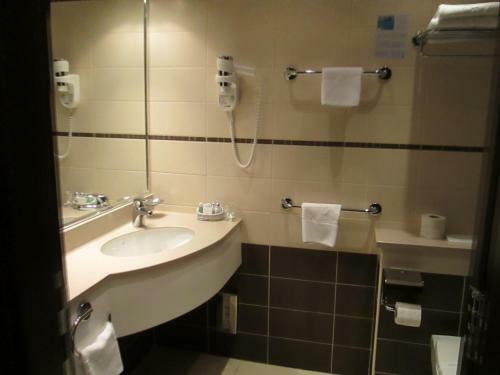 Each room includes a private toilet equipped with a bath or shower. For your comfort, you will find free toiletries and a hair dryer. The nearest flight terminal is Rijeka Airport, 107 km from Villa Mozart. Veli Losinj ( ~ 4.3 km ): 85+ accommodation units. Cunski ( ~ 7.9 km ): 68+ apartments. Susak ( ~ 13.2 km ): 5+ apartments. Nerezine ( ~ 15.1 km ): 36+ apartments, 6+ villas, 2+ hotels. Osor ( ~ 19 km ): 6+ accommodation units. Beach Veli Zal, Mali Losinj ~ 0,9 km from Authentic Adriatic Gravel beach: ideal for families, recommended for young people, awarded with blue flag, with restaurant, with caffe bar, equipped with showers. Excellent choice of watersports. Beach Kadin, Mali Losinj ~ 1,2 km from Authentic Adriatic Rocky beach: recommended for young people. Beach Valdarke, Mali Losinj ~ 1,3 km from Authentic Adriatic Gravel beach: ideal for families, recommended for young people. Excellent choice of watersports. Beach Cikat, Mali Losinj ~ 1,5 km from Authentic Adriatic Sandy beach: ideal for families, recommended for young people, with restaurant, with caffe bar, equipped with showers. Excellent choice of watersports. Beach Srebrna Uvala, Mali Losinj ~ 1,6 km from Authentic Adriatic Gravel beach: ideal for families, with restaurant, with caffe bar, equipped with showers. Excellent choice of watersports. Restaurant Veli Zal, Mali Losinj ~ 1,3 km from Authentic Adriatic Address: Suncana Uvala, Mali Losinj. Restaurant Gostionica Marina, Veli Losinj Guest reviews: 8,3/10 ~ 2,9 km from Authentic Adriatic Address: Obala Marsala Tita 38, 51551, Veli Losinj. Restaurant Gostinica Marina, Veli Losinj Guest reviews: 10/10 ~ 2,9 km from Authentic Adriatic Address: Obala Marsala Tita 38, 51551, Veli Losinj. Prices: 146 HRK - 291 HRK. Cuisine: Mediterranean cuisine, Croatian cuisine. Restaurant Konoba Ribarska koliba, Veli Losinj Guest reviews: 7,3/10 ~ 3 km from Authentic Adriatic Address: Obala Marsala Tita 1, 51551, Veli Losinj. 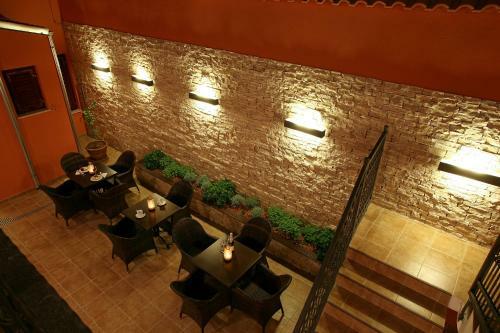 Restaurant Borik, Mali Losinj ~ 1,2 km from Authentic Adriatic Address: Suncana uvala bb, 51550, Mali Losinj. Cuisine: Mediterranean cuisine.